I've been off these last few days as life is becoming busier and busier. However, today I've decided to write a Little bit about EVERYMAN a play which has taken place at the National Theatre in London, but it's not on anymore as it was being played until 30th August. "Everyman is successful, popular and riding high when Death comes calling. He is forced to abandon the life he has built and embark on a last, frantic search to recruit a friend, anyone, to speak in his defence. But Death is close behind, and time is running out. 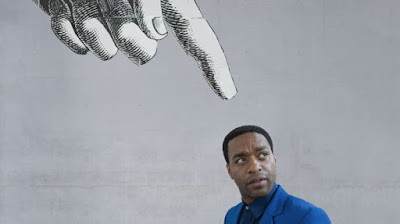 Chiwetel Ejiofor is a good actor so that it's difficult to make a critic on how he performed for EVERYMAN, but I dare to say that this is not his best role. Unfortunately the play isn't on anymore so its pointless to explain how to get tickets for it. But as it's the National Theatre, and to be exact, the Olivier Theatre where there are other plays running (The Beaux' Stratagem and Our Country's good), you can get day tickets for £15 or maybe standing tickets for £5.